New Delhi, India -- In its extended sense in the Buddhist texts ‘Sangiti’- (‘sam+gai’) means collective recitation, proclamation, rehearsal. It has finally come to signify general convocation of the Buddhist monks in order to settle the questions of the doctrine and to fix text of the scripture. In the Saddharma Pundarika Sutra we get the reference to the experts in proclamation of the doctrine of the Tathagata (Sangiti kusala Tathagatadhammanam). The Buddhavacanna is the word or the teaching of the Buddha. It sometimes expresses ‘Buddhavisaya’- the range, scope, or power of the Buddha. ‘Buddha Vennayya’ is also found in Pali literature –one is able to be led to enlightenment or accessible to Buddha’s teachings. ‘Buddhasasana’ renders the same there as the teaching or instruction. Mahakassapa was alarmed by these remarks, and feared that the Dhamma and the Vinaya might be corrupted and not survive intact if other monks were to behave like Subhadda and interpret the Dhamma and the Vinaya rules as they pleased. To avoid this he decided that the Dhamma must be preserved and protected. To this end after gaining the Sangha’s approval he called five hundred Arahants. Ananda was to be included in this provided he attained Arahanthood by the time the council convened. Seven days after the Lord of the worldwide, i.e. the Lord Buddha gifted with the Ten Powers, had attained the Parinibbana, the Thera Mahakassapa recalled to his mind the evil words of Subbhadda. 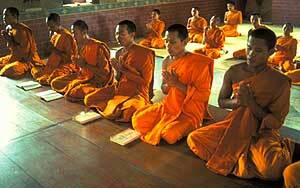 To hold the Great Council the great Thera appointed five hundred eminent bhikkus who had overcome sins. The above passage clearly shows that, when the Vajjiputtas were not following the Vinaya as Buddha asked to follow, the Thera Yasa conducted the second Council to restore the purity and sanctity of the Budddhavacana. Two hundred and twenty-eight years after the Parinibana of the Sambuddha, a group of heretics numbering sixty thousand, being deprived of honour and patronage, and with not even enough to eat, they sought that honoured patronage, they themselves cut off their hair, donned the yellow robes and went to the viharas, entering even the assemblies at the time of the Posada and other services. They wrought diverse cankers stains and nuisance in the Sasana. Therefore in the whole Jambudipa the Order of Bhikkhus did not hold the Uposatha ceremony for seven years. At that time Asoka came to the throne. Wishing to purge the Sasana of sins, he called the Order of Bhikkhus together at the Asokrama. In that congregation, the Venerable Thera Tissa, Moggali’s son, being the senior of the Order, instructed the king in the doctrine. The king asked the teachers of others’ views, and discerned: “These are none of them (proper) bhikkhus but heretics.” And having caused them to the expelled from the Order, he bestowed white lay-raiment upon them. Then the king said: “Now, sir, the Sasana is purged. Let the Order of bhikkhus hold the Uposatha ceremony”. And, providing a guard, he entered the city. The Order assembled and held the Uposatha ceremony. Now the role of different social movements in protecting the purity and sanctity of the Buddhavacana. Socially Engaged Buddhism: In reference to the large Sutra on perfect wisdom, Indian Buddhist texts “identify and address sources of human suffering outside of the cravings and ignorance of the sufferer – such as social, political, and economic injustice an often-cited criterion of contemporary “engaged Buddhism”. Focusing on poverty, it concludes that those sources distinguish between compassionate intentions and actions and between material and moral benefit. Furthermore, relief of poverty is pre-requisite for moral development and its neglect is seen as a cause for social degeneration. Therefore, in order to prepare the conditions necessary for teaching the Dharma, the bodhisattva is called to relieve these material wants, not only through moral leadership, but also through direct action . In this way Socially Engaged Buddhism is protecting the purity and sanctity of the Buddha Dhamma by encouraging the people to fit to take steps in practicing Buddha Dhamma, because these ordinary beings cannot understand the higher teachings of the Lord Buddha. Myanmar is known as one of the Theravada Buddhist countries. It is also known as the country which preserved Buddhavacana as it is for a long time. It has conducted sangitis in the past by the name catasanghayana. At the present day if one wants to comment on the sanctity and purity of the Buddhavacanna, he should take into account the period of British Colonial Rule. It happened that British sent the Christian missionaries to Myanmar and started converting Buddhists into the Christians. In his book, ‘Abhidhamma in day to day life’, U Janakabhivamsa writes: “Myanmar Sangha has had a succession of trained teachers, since the Buddhism was introduced in Burma. But at present Myanmar Sangha is short of teachers to train the youth”. In Thailand ‘Engaged’ Buddhism has become a living alternative movement to put into practice the ideals of Buddhism and to allow more people to have access to an alternative conception of liberation. I am currently involved in the Ariyavinaya (noble discipline) project which aims to transform the Sangha. Ariyavinaya refers to the code of conduct for monks and nuns and the importance of discipline in the lives of monks and nuns. Broadly speaking, it links spiritual training with practical action. The Ariyavinaya project consists of a series of workshops that focus on how the Buddhist community can better meet the demands of collective violence and consumerism in society. The workshops emphasize the need for greater social engagement in monastic communities, and give attention to gender issues in Buddhism, and alternative education . In Thailand, through engaged Buddhism, a winner of the Gandhian award Sulak-Sivaraksa has started a campaign to protect the Purity and Sanctity of Sangha. This is a golden opportunity to the monks who are working in different fields like laying roads, constructing bridges; maintain schools, establishing hospitals and the monks who are working against injustice and violence. Practice and precept go together in other words as they can practice Vinaya and put it into action for the good of the society. “The politician tries to reform society by means of external devices like the baton, the gun, the prison and the gallows. Sarvodaya tries to reform the society by an internal change in the individual through the means of Metta (loving kindness) and Karuna (compassion). “The politician builds culverts, bridges and high-rises. Sarvodaya builds the human hearts. The politician turns the pages of the penal code to get the people onto the correct path. Sarvodaya turns the pages of Dhammapada to get the people onto the correct path. It is also holding the meditation camps to promote peace in the Island . India’s story is altogether different. Buddhism originated in India but disappeared after the 12th century. One reason for the decline of Buddhism was Vandalism, where the purity and sanctity is lost. Many people have tried to revive Buddhism in their own way but met with limited success. There are many great shrines in India. Some of them are associated with life of Lord Buddha; these are under the care of Archaeological Survey of India at present and have become a big draw for tourists and pilgrims from all over the world. Many Monasteries are established in India by different countries. They represent both the Mahayana and Theravada traditions and are taking care of pilgrims from their home countries. But I observed that many an abbot of these temples are giving ordination to unqualified lay people. Secondly few abbots are seriously engaged in the local politics in the name of social work. Thirdly few abbots are also engaged in money making commercial activities. Though they are donating the money to the shrine under the control of the archaeological department of India, I am afraid such activities will destroy the sanctity and purity of the Buddhavacana. i) Edited by Christopher Queen, Action Dharma, Stephen Jenkins P.36. Ven. Sumedha the author teaches in the Department of Buddhist studies, Delhi University.